Gordon Brown has defended his choice of ex-HBOS chief Sir James Crosby for a senior role with City regulator FSA. It comes the day after Sir James resigned as deputy chairman of the FSA over claims he ignored risk warnings. Mr Brown told MPs he appointed Sir James on an independent panel's recommendation and had not known at the time the FSA had concerns about HBOS. But the Tories said that, as chancellor, he should have known what was going on at the bank. 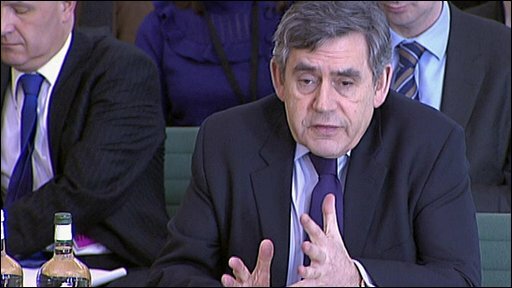 A spokesman said: "Gordon Brown set up this system [the FSA] but appears completely ignorant of its warnings. "If he knew what was going on why didn't he act? If he didn't, who on earth was running the economy while he was chancellor?" Sir James resigned as deputy chairman of the FSA - the Financial Services Authority - after claims from HBOS's former head of risk that he had been axed by him after warning that the bank was growing too fast. Mr Brown, who was giving evidence to a panel of select committee chairman in his twice yearly appearance before the Commons liaison committee, insisted whistleblower Paul Moore's allegations had been investigated by the FSA and found to be without substance. He added that the problems alleged by Mr Moore were not the reason HBOS fell: "It was because its whole business model was wrong." HBOS and Sir James have both denied Mr Moore's allegations, but it emerged on Tuesday that the FSA had warned the merged Halifax/Bank of Scotland group about its business model. In a statement the regulator said it had raised concerns about the way HBOS was being run as far back as 2002 before and after Mr Moore left the company. Questions had been raised by opposition MPs about whether Mr Brown, who was then chancellor, was aware of the warnings about the business model of the bank, which had to be rescued using taxpayers' money last year. But he told the liaison committee "no information" was given to the Treasury "about the issues raised between the FSA and HBOS", adding that "these were regarded as ordinary issues that were normally dealt with by the interaction between the FSA and HBOS". He said: "The FSA are statutorily responsible for their action in this area. I believe that the right decisions were taken." On bank bonuses, he denied a claim by Treasury Committee chairman John McFall that he was being outflanked by US President Obama who has capped such payments to bankers. Mr Brown said the FSA should be given the right to penalise banks if they operated short-term bonus schemes and took excessive risks. He said new legislation could be announced by the time of the next Budget, which will be on Wednesday, 22 April, to beef up the regulator's powers in this area. He told MPs: "The short-term bonus culture in banks has got to end and we are putting in measures that will bring that to an end." He said bonuses should be based on performance over a number of years. "I believe the bonus structure has got to be over a number of years and not over one year, if it is to exist at all in these banks, and at the same time it should never be a one-way bet. "In other words, if you fail there is a claw back that is also possible within a bonus system." He also reacted angrily to claims Britain may end up having to seek emergency funding from the International Monetary Fund, saying such a suggestion was an "absurdity" and repeating his claim that Britain still had relatively low levels of public debt. He said lessons had to be learned from what had happened in banking and the regulatory system had to be "improved" but said it had to be achieved "with global cooperation amongst regulators". "We will push ahead at the G20 meetings in London for reforms not only of national systems but for international regulations for the banking system." Mr Brown was accused of chasing headlines by coming up with one initiative after another to help businesses and individuals fight the recession without following them through. He denied this, saying: "What we have done, with a few exceptions, has now been followed by other countries around the world." He was tackled later on the government's £12bn temporary VAT cut, admitting it had not been copied by other countries, but also insisting it had been the right thing to do. The two-and-half hour session in Westminster focused mainly on the economy but the prime minister was also quizzed on foreign affairs and a range of domestic issues on housing, transport and government spending. On the Gaza crisis, he said Middle East peace envoy Tony Blair had a role to play in achieving the international community's aims, working with Mr Obama's special envoy to the Middle East, George Mitchell. But he said those aims would not necessarily include a government of national unity in Palestine or allowing Mr Blair to talk to Hamas, as the chairman of the Foreign Affairs Committee, Mike Gapes, said was needed. He was pushed about whether there was a need for a troop "surge" in Afghanistan, of the kind thought to be being planned by the Obama administration - he said it was more important to increase numbers in the Afghan army which were "completely insufficient" at the moment. He also said it was "premature" to say whether President Obama would scrap the planned missile defence shield in Europe and he wanted to talk to the new US President "about these issues". But he said he believed progress could be made on nuclear disarmament and the renegotiation of the non-proliferation treaty. On the domestic front, Mr Brown defended the NHS computer system, which has been beset cost over-runs and delays, saying it was "a necessary project". He is trying to justify an untenable position. Does he not realise honest contrition would go down better? On Transport, he refused to be drawn on whether the government would step in to rescue train operating companies who Transport Committee chairman Louise Ellman said were in financial trouble due to falling passenger numbers. But he also suggested next year's fare rises could be less severe, as they will be linked to the retail price inflation figures in July this year, which are likely to be lower than last year. 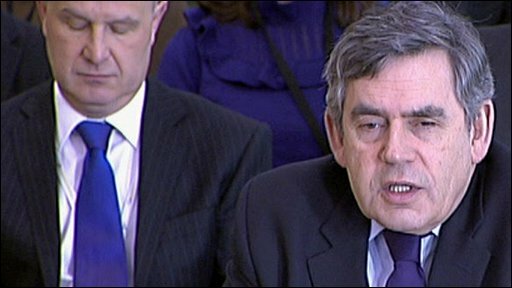 Mr Brown's session before the committee came the day after Bank of England governor Mervyn King said that the UK was in "deep recession". It was also revealed that UK unemployment had risen to 1.97 million between October and December, the highest level since 1997.